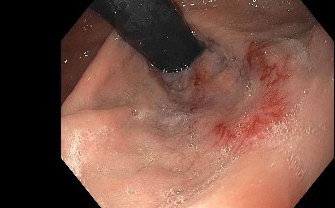 This post assumes you’ve read the two preceding ones: “My 13th — and Perhaps Final — Portal Hypertension Bleed” and “In Which a Transjugular Intrahepatic Portosystemic Shunt (TIPS) Is Installed in My Liver.” This post is my subjective, and given the subject, patchy account of a few dreadful days. I will share what I later learned about hepatic encephalopathy in a future post. For well over half a century, I’ve known the answer to the question: What is your birthday? Even when I was missing my four front teeth and saying “December twenty-six” was a twister, I could answer that question: It’s the day after Christmas. 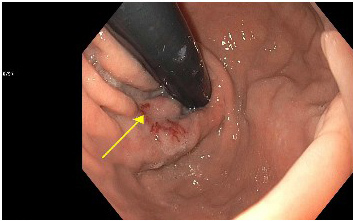 On July 23, 2015, one week after my TIPS procedure, I couldn’t find the answer. I knew I knew it, and that knowing—that is, knowing this was happening—that I had lost a nearly lifelong memory—was horrifying. I was suffering from hepatic encephalopathy. My liver could not handle the ammonia it normally filtered, the ammonia had crossed the blood-brain barrier, and I was unable to make new memories or access information long stored and always before easily within reach. I left the hospital Sunday, July 19, 2015. 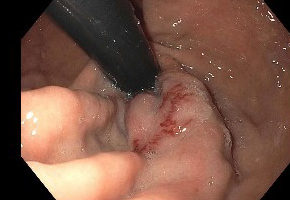 The installation of my Transjugular Intrahepatic Portosystemic Shunt (TIPS) was deemed a success. My portal hypertension, which was 15 (dangerously high) when the radiologists began the procedure, had dropped to a normal range of 2-4. At first my liver function numbers were all over the place, but that was to be expected. My ammonia levels were high, but had steadily dropped. 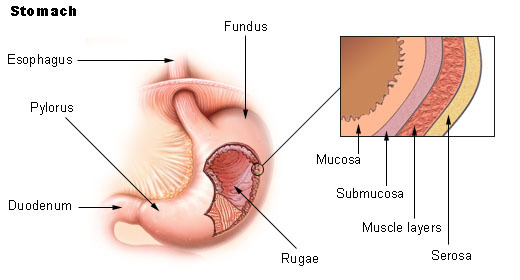 My digestive system seemed to have woken up from the general anesthesia. I complained of constipation, but I did have a bm. I know that Monday I slept all day, and I expect I did on Tuesday and Wednesday as well. I had had a rough two weeks. The first weirdness was pre-dawn Thursday. I could not get warm. I like a cold room when I sleep, and keep a lot of covers handy year-round. But I could not warm up. At some point Thursday morning my husband noticed I wasn’t making sense when he asked if I wanted anything to eat or drink. I was somnolent, very hard to rouse. I have no memory of this. He told me he called my primary care physician and gastroenterologist. It was only a few days later that I remembered anything at all about having been at the GI’s. Leaving the house, I walked right past a huge display of flowers that had arrived that morning from my brother: I had no memory of them when my husband mentioned them later. I have a vague memory of either getting into or out of the car at the doctor’s, of looking up and seeing my daughter had joined us in the consulting room, and of sitting in the room (I guess that I wasn’t lying down because they didn’t want me to sleep). I’m told that the physician’s assistant offered to send us along with a prescription for Lactolose, a strong laxative which I’ll discuss in the next post, but since my husband and daughter wouldn’t have known what to do if I didn’t respond to this drug or what to expect or danger signs, they—I believe quite rightly—chose to take me down the street to the ER. I have no memory of getting there or of the usual procedures (and I’ve been in the ER enough to know), like signing in, waiting in the first waiting room area, going to the triage nurse, and having vitals taken. I do remember being in the second waiting area, and I guess all the action had woken me up enough so that I realized what was happening. Hepatic encephalopathy is the complication of a TIPs I feared the most because it involves your ability to think and remember. At its worst, it can lead to coma, sometimes reversible, sometimes not. To the other people in the waiting room, I must have looked fine – no ice packs, bandages, vomit bag, etc. But each moment that passed I believed I was closer to losing my mind. At some point I must have asked for a DNR (Do Not Resuscitate) bracelet because much later I noticed I was wearing a purple bracelet I’d never seen before. At some point—an hour? two?—I was taken back into the examining area. After a while, I said to my husband, aren’t they going to do anything? They haven’t even started an IV. They always start IVs. He said, look at your hand. I looked down, and saw I had an IV. I in fact had what I’ll call a double-barreled I on the back of my hand—a painful place for a stick—and I am one of those people with small veins that roll, etc. Was I too somnolent to feel an IV going in? Did I feel it but was unable to remember having felt it? Was I, in other words, unable to form new memories? What is your phone number? I hadn’t a clue. What is your birthday? I know this, I do, I know this. I couldn’t find it. What month is it? 12? How strange. I have this very vivid memory of not knowing these answers. The rest of Thursday is vague to me. I don’t know if I had anything to eat that day. I can’t tell you if it was day or night when I got into a room. This might not seem unusual, except that here going from the ER to the in-patient hospital requires an ambulance ride across a street. But I remember being able to get from the gurney to my bed without help. Then it was Friday. I remember very little of it until the evening. Then it was time to start trying to figure out what had happened. 8/15/17: Folks, I have stepped away from this. I’m no longer keeping up with it. So far I still have enough iron reserves, over 2 years since my injections, and since I had the TIPS procedure (a shunt to relieve portal hypertension in my liver), I have had no bleeds or anemia. I’d like to add, however, that you need to do something about severe anemia because over time it can stress the heart. But that is another story. Best of luck, and if you have reactions, strongly encourage your hematologist (and use a hematologist, not a family doctor) to report them to the company. Best of luck! (And I no longer eat ice, by the way!). Today (8/25/16) I sent an e-mail to American Regent, the company that markets Injectafer in the US, with a link to the comments page. On the contact page, there is an email address for reporting Adverse Drug Events, if you would like to contact them yourself. I have ceased having bleeding from my varices and my blood counts are normal. I am glad that I was able to tolerate Injectafer well enough to get my body the jump-start required to bring my iron reserves to normal levels. The usual caveats about this not be medical advice, etc. all apply to the following. My purpose in writing this post is to provide something I couldn’t find when I was scheduled for and after I had an Injectafer iron infusion last April: a personal account. There are a number of resources for studies of Injectafer’s safety and effectiveness, but that is not all I want to know. Injectafer was approved by the FDA in July 2013, so it is fairly new. My understanding is that the older types of iron infusions are a lot more problematic, side effects were more common, and it took hours to receive the infusion. But I have no experience with that. If you are here, you probably already know that delivering iron through an IV is an alternative when oral iron supplements haven’t worked in alleviating iron deficiency anemia. 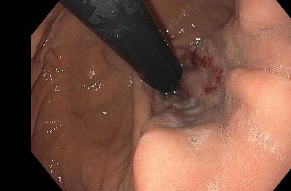 Followers of this blog will know that, as a consequence of primary biliary cirrhosis and portal hypertension, I have had 10 gastric bleeds from burst varices and 17 transfusions since August 2010. The past (nearly) 14 months have been good ones, with only a single 2-transfusion bleed in February 2014. However, in spite of the 2 transfusions, I continued to feel run down and fatigued. For one thing, although the normal hemoglobin range is 12 to 15 (or 11.7-15.5. or 11.3-15.2 — depending on the lab; I have results from 3 labs here), transfusions after a blood loss, which usually adds about 1 point to the score per transfusion (or so I think — again, an ordinary person’s understanding and not a hematologist’s is all you are getting here) are usually stopped once the patient gets into the 10s. One reason is that with every transfusion, the possibility of having a reaction to the next is more likely. Another is that usually the patient’s body will bring itself up to normal levels in a few weeks either through diet alone or with iron tabs. 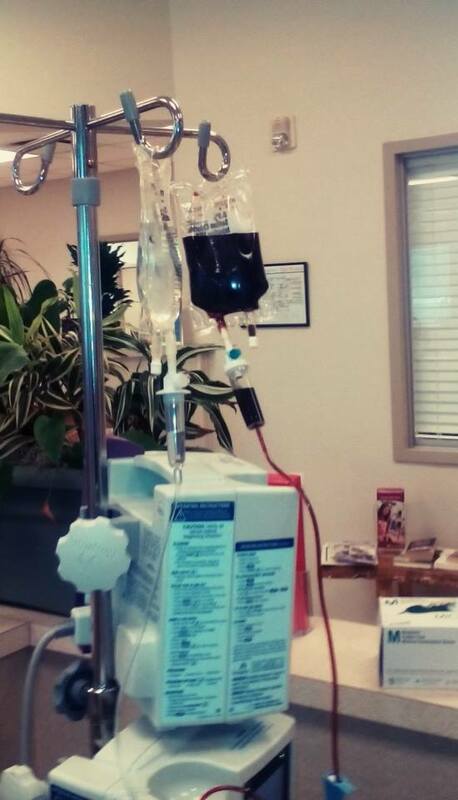 The first of April, about 6 weeks after my 2 February transfusions, I had my labs done and my hg was 9.7. I can cope in the high 9’s, but coping is about all. Basically, being anemic means being oxygen deprived. If you want a similar experience, go hiking at sea level for a few hours, and then go above 12,000 feet and do the same. In another couple of weeks I had crept up to 10.5 on the 12 -15 scale; better, but not great. My family doctor sent me to a hematologist. My iron level was 31; normal is 40-160. 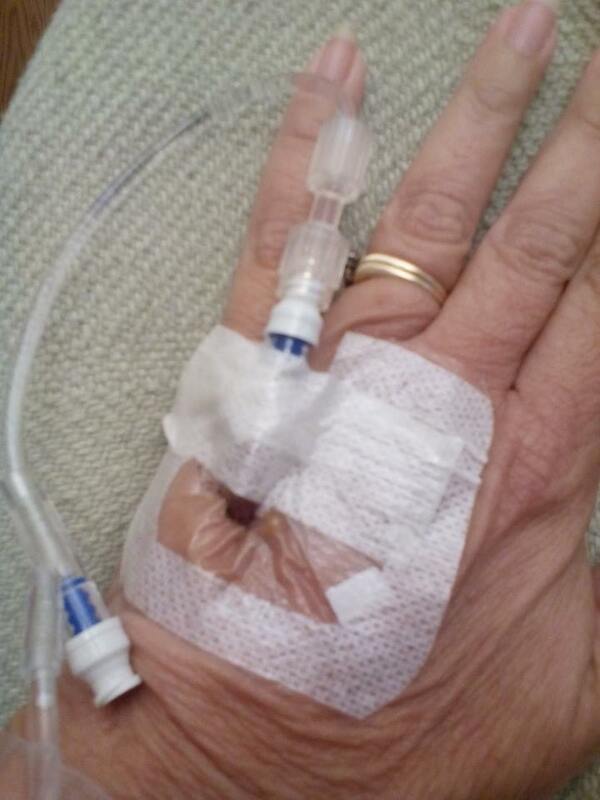 Two Injectafer infusions were scheduled for a weak apart for early May. Hematology and oncology go together, and I know that since I don’t have cancer I should have nothing to say about this other than how grateful I am. But the truth is, it is really a sad and sobering experience to have to go to an oncology infusion center. Most people are there for chemo. Of course I knew I was the lucky one in the room, but you know, it is still depressing. In fact, I think the worst part of the whole process was when I was waiting to schedule my little infusions and the man ahead of me broke down crying at the desk. The doctor came out and said this time it wouldn’t be so bad. It didn’t help much. Getting the infusions was quick. Each took about 20 minutes for the little bag to drain into my veins. 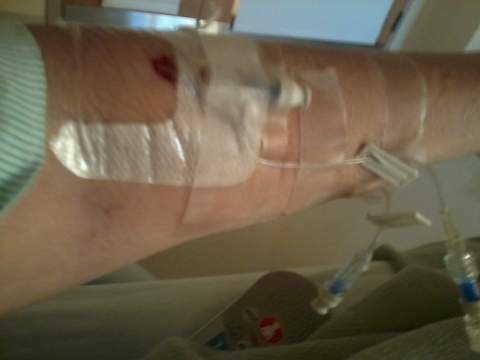 It hurt a bit, but not badly; it’s an IV and those are rarely for me painfree. The iron looks like you might expect — brownish with a bit of red. I thought the infusion would have immediate effects, that I would leave the building infused with energy. Most surprising was that I actually felt worse for several days after the first infusion. I felt like I had been run over by a steamroller that had then backed up and done it again. I felt like I had reached the end of hope, that for the rest of my life I would never again have energy. I didn’t feel much of anything after the second. But about a week later, I noticed that I wasn’t dragging around so forlornly. After another week, I stopped eating ice. I used to eat ice all the time. I mean it, all the time. In the middle of the night I would awaken to eat ice. Simply sipping water wasn’t enough; I’d have to go to the freezer for ice. I’d never leave home without at least one tall glass full. When I traveled I carried a small ice chest, full of ice. I decided I would probably not ever enjoy going to Europe again because I remembered the one time I went to the UK, 35 years ago, getting ice was hard, and I simply liked it then. I had my favorite source of ice: Sonic. One of the things that made hospital stays tolerable was that hospitals have good ice. The only thing I missed when I moved a few years ago was the crushed ice dispenser on my fridge door. I craved ice. Then I didn’t. I still am thirsty all the time because I have Sjorgen’s syndrome which means my salivary glands are also under attack by my immune system, so my mouth is always dry, and my teeth have gone to hell, but I don’t eat ice. I drink fluids. Eating ice is a pica — the consumption of non-nutritional substances, like chalk, soil, or sand as well as ice. Frankly, for an anemic, it seems it would make more sense to crave soil, but I’m glad it doesn’t, and of course, talking what makes more sense among things that don’t make sense is senseless itself. But no one knows why people with anemia crave ice. On June 2 had an hg of 13.9, up from the 9.7 hg of April 2: a significant improvement, and my iron reserves zoomed from 31 to 163 at the end of August. So now I have stored iron with which to make new red blood cells. On 9/11 my hg was 13.6. So my experience with Injectafer: excellent. I wish I had known it would take weeks to work and I’d actually feel worse for a while after the first infusion, but now, if you are wondering what to expect, you have one report from the field.